Simon & Schuster, 9781476714813, 208pp. Snow Hunters traces the extraordinary journey of Yohan, who defects from his country at the end of the Korean War, leaving his friends and family behind to seek a new life on the coast of Brazil. Throughout his years there, four people slip in and out of his life: Kiyoshi, the Japanese tailor for whom he works; Peixe, the groundskeeper at the town church; and two vagrant children named Santi and Bia. Yohan longs to connect with these people, but to do so he must let go of his traumatic past. 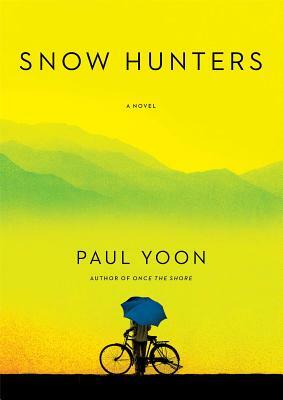 In Snow Hunters, Yoon proves that love can dissolve loneliness, that hope can wash away despair, and that a man who has lost a country can find a new home. This is a heartrending story of second chances, told with unerring elegance and tenderness. “At first glance Paul Yoon appears to be the perfect miniaturist, but behind every subtle gesture this novel shimmers with a deep and complex history. Snow Hunters is a beautiful and moving meditation on a solitary life." “Paul Yoon's sentences are startlingly beautiful. Lucid and clean and resonant, they build, in Snow Hunters, to form a novel that is deceptively light and extraordinarily tender." "Snow Hunters reads like a dream. In this quiet, evocative rendering, we espy lives muted by war, altered by loss and displacement, and ultimately mended by the salvaged threads of memories and love. Paul Yoon’s writing intimates the emergence of a master stylist, each sentence a jewel to be admired." "A spare novel, set in an unexpected bypath of history... At a certain point, I realized this wasn't going to be a regular novel—where we watch who does what to whom—but a book about solitude, the hardest thing to frame fiction around. The transplanted Yohan is a great observer of the physical world, but he can only reflect so far; other people are mysteries to him. Who would think you could make a story out of this? Mystery in the wider sense is what this novel evokes." — Joan Silber, "Favorite Books of 2013"